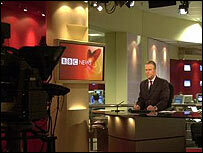 BBC News aims to report what matters in the UK and around the world. Of course not everyone agrees about what is really important - it is a matter of editorial judgement. Our audiences do not look at events in the same way. There is no one universal news agenda that applies to all. That is why we broadcast in many different styles and why a story given prominence in the UK may not even be mentioned by our international channels. But no matter the audience, our journalism tries to lay out why a story is significant - or at least in what way a story is new. Sometimes that will be obvious. When broadcasting in Britain we know that our audiences will want to know about floods in the UK, or changes in how much tax they will have to pay, or the progress of a war involving British troops. But sometimes we will be reporting on events that might not have an immediate or obvious impact on people's lives. Those stories - in business, politics or science and so on - are important too because we want our audiences to have a flow of information about a wider world. We have foreign correspondents, correspondents around the UK and subject specialists who can throw a spotlight on people who are not widely known, on stories that have not yet become common currency and on trends that are developing. If our news diet were restricted to the immediate, the dramatic or the obvious, we would be guilty of depriving people of a chance to understand the background and context of the world around them. The BBC sees its audience as citizens who have the right to independent and impartial information. When a BBC correspondent reports a story, the aim is to provide an insight based on evidence and on professional judgement - uncluttered by commercial interest or the need to support a particuar proprietor or ideology. We should not be driven by what other media organsiations are saying about a story. Nor should we assess a story's importance by measuring the prominence it is given elsewhere. We need to work out for ourselves what matters and what is just spin, public relations or chaff. It is the BBC's job to look at news with a fresh pair of eyes - and not to be driven by the agendas and interests of newspapers, pressure groups, political parties or governments. We should not be frightened of controversy - but we should always be alert to the dangers of glibness, to the idea that every problem has a simple solution. So above all we need to be inquiring and open-minded - unafraid to surprise our audiences with a view of a story that is different - and always looking for a wide range of evidence and opinion.